J. Edgar Hoover (the FBI Director) was very aware of Rutherford’s political positions during the late 1930s and 1940. He knew that Rutherford decreed that Jehovah’s Witnesses should not support any war preparation efforts, not salute the flag of any country, and to avoid military service of any kind – even under threat of arrest or imprisonment – or death. Hoover’s memo makes it clear that “Judge” Rutherford had been monitored for some time by the United States Government. In fact, he mentions that a dossier on Rutherford was being sent along with the memo. 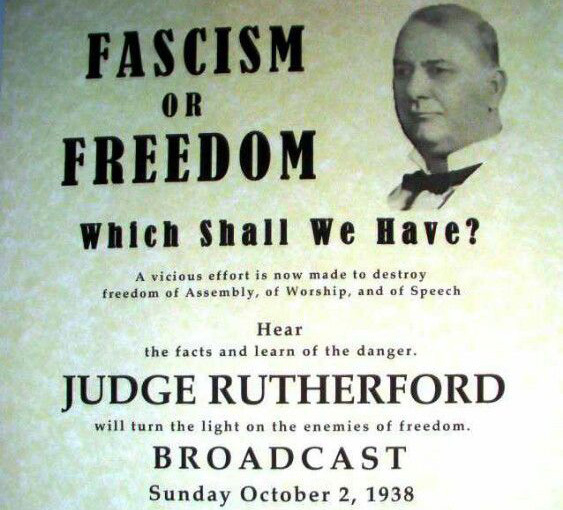 It was likely that Rutherford’s praise of Adolph Hitler and the leaders of other “fascist” countries during the late 1930s created some “red flags” within the FBI and other government agencies. It was also significant that Rutherford and other Watchtower officials had been arrested, convicted and imprisoned for a short time in 1918 and 1919 – for taking anti-government positions during World War 1. [See Wikipedia quote below.] While the Watchtower leaders’ convictions were overturned and they were eventually released from prison in 1919, Rutherford continued to preach loud and often against the political systems of the world and their armies. He often accused various governments of being in league with and led by Satan the Devil – and wars were clear evidence that his position was valid. Rutherford also severely criticized the world’s major religions – especially the Catholic Church – for supporting war efforts by the world’s governments. In 1941 Hoover’s FBI was (and to some extent, still is) perhaps the most powerful and influential police force in the world. What Hoover asked for he got. No other government agency would take a stand against him or the FBI. Even the most powerful politicians avoided any conflict with him, preferring to “turn a blind eye and a deaf ear” to Hoover’s sometimes excessive use of authority. Less than a year later, on January 8, 1942, “Judge” Joseph F. Rutherford died in San Diego, California from cancer of the lower bowel. He lived just long enough to see the United States enter World War 2 one month earlier. After nearly twenty-five years of unrelenting scathing attacks on the world’s governments and churches, his voice was silenced forever. But many of his Jehovah’s Witness followers he left behind did refuse military or government service during the World War, Korean War, and the Viet Nam war and some of them spent years in prison. Although Rutherford died in 1942, his legacy of hatred toward government and intolerance of other religions, particularly the Catholics, endures among JWs and even some ex-JWs until today. Rutherford’s pious, self-righteousness endures. The vile rhetoric spewed out of his mouth like poison. It’s no wonder the authorities kept a close eye on him.